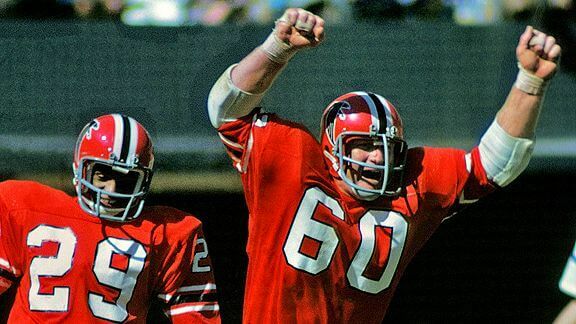 On June 30, 1965, the Atlanta Falcons were born. The NFL Commissioner Pete Rozelle granted ownership to Rankin M. Smith, Sr., the executive vice president of Life Insurance Company of Georgia. The name Falcons was suggested by Julia Elliott (1909–1990) a high school teacher from Griffin, Georgia who won a contest in 1965. Though 40 other contestants had also suggested the name, Elliott wrote in an essay, “The falcon is proud and dignified, with great courage and fight. It never drops its prey. It’s deadly and has a great sporting tradition.” Among the many suggested names were the Knights, Bombers, Rebels, Crackers, Thrashers which would later be the name of the city’s second NHL team, Lancers, Firebirds, Fireballs and Thunderbirds.” The Atlanta Falcons began their first NFL season in the NFL Eastern Conference, playing a “swing schedule”, consisting of playing every other team once, in order to make up for the disparity of an odd number of teams. Their first game (preseason) was on August 1, 1966 against the Philadelphia Eagles before a crowd of 26,072 at the Atlanta Stadium.